Brothers eagerly wait to get the rakhi tied by their sisters. 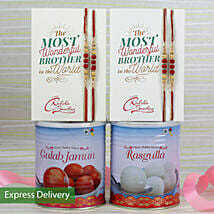 This day celebrates the purity of the relationship that exists between the siblings. It is their love and affection that matters the most. 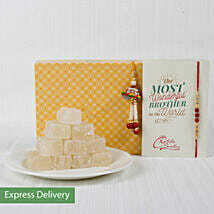 Sisters can send rakhi with sweets to Meerut for their brother online. The various rakhis that are available online will surprise you. 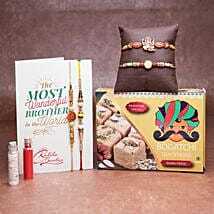 You can use the rakhi buy online option and explore all the rakhis available chosen specially to celebrate the relation between you and your brother. And if you are particular about wanting to wish your brother exactly at 12 am our store has a solution to that too with its midnight delivery option that makes it very convenient for you. From north India to the south, we provide shipping throughout. 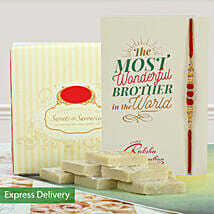 If you have a brother in Hyderabad and you're unable to send him a rakhi, choose one from our website and do so with easy delivery. You can send rakhi online to Hyderabad and save your time and money. You need to spend time in the markets searching for an appropriate rakhi. Our site offers you everything in one place. 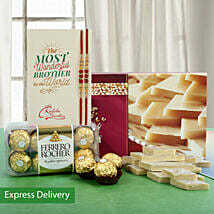 You can send rakhi with sweets to meerut online even if it means surprising your brother with the delivery at midnight. Sisters in Meerut now have a one stop solution for all their rakhi requirements. 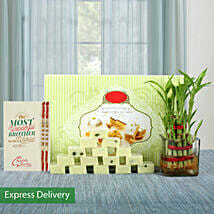 Order rakhi with sweets in Meerut online and save time, money and energy. With the plethora of rakhis available you don’t have to go searching for a rakhi anywhere else. 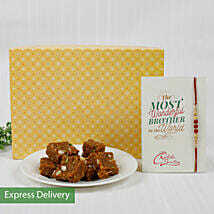 The festival is definitely incomplete without sweets and what more when our site provides you with that too.